This week we all had a great spring vacation, and spent a few days at the coast in Seaside, Oregon. I will share more about our mini beach vacation later this week. I thought I would share a very yummy side dish that I made earlier in the week. 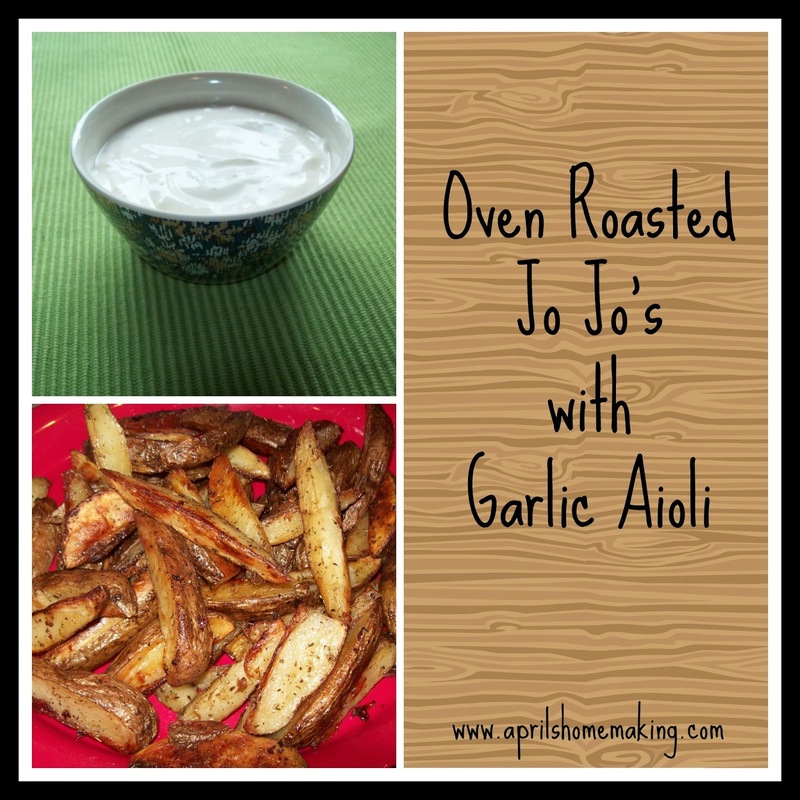 Oven roasted herbed Jo Jo's with a delicious easy to make homemade garlic aioli. Making your own oven roasted potatoes is easy. First cut your potatoes into wedges, for average sized potatoes I usually cut them into 8 wedges. Put them into a large bowl and drizzle olive oil over them to thinly coat ( I was a little heavy handed this time), then shake in some Italian herb blend (add to taste and according to how many potatoes you are cooking), toss until all potatoes are coated in oil and the herbs have been somewhat evenly distributed. Then transfer to a rimmed baking sheet. Once they are spread out into a layer on the baking sheet give them a sprinkling of sea salt and fresh ground pepper to taste, I like to go easy on the salt, you can always add more later. Bake at 450 F. for around 45 minutes to an hour, until they are cooked through and golden brown, check them and turn them a few times while cooking. Here they are, all roasted up and ready for dinner. I served these along side some steamed and herbed chicken and broccoli, with freshly made garlic aioli dipping sauce. I love garlic aioli, and have enjoyed it in restaurants with various dishes, I had always wondered how to make my own, it turns out the recipe is very simple. Mix one cup of mayonnaise with two freshly pressed cloves of garlic, roughly 2-3 tablespoons of lemon juice, and salt and pepper to taste. Add a bit more lemon juice if you need to thin the sauce a bit. Stir until the ingredients are all incorporated, then chill for around an hour. We all enjoyed this sauce, and knowing how easy it is I have a feeling it will make regular appearances around our meals! Here is another batch of garlic aioli I made up today for lunch. My family loves roasted potatoes, the flavor is wonderful and they make a wonderful side dish to many different dinner, as well as a nice lunch side dish. 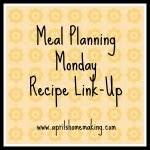 I am hosting week 4 of my new link-up party, Meal Planning Monday Recipe Link-Up, I hope you stop by and check out all of the wonderful recipe and meal planning ideas that everyone shares, as well as link up any of your recent recipe posts! I hope everyone had a nice weekend! Yummy! The sauce sounds good too, I never thought about mixing garlic and mayonnaise.